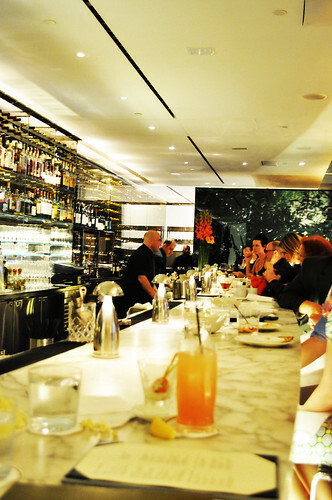 With the beautiful weather we had this past weekend at dusk, I spent my Saturday evening at The Bar Room at The Modern (adjacent and the restaurant within the Museum of Modern Art, aka MoMA) with Ariana catching up over some delicious bites and drinks. The entrance to The Modern is probably the most original one I've come across. The window display is changed regularly (I believe it's several months at a time, depending on the installation at hand), and the theme is for the most part modern/contemporary art. This particular installation, per The Modern's seasonal e-newsletter, is "inspired by the elaborate window displays that typify MoMA's Fifth Avenue environs" and created by artist Andrea Zittel. In this piece, Untitled (2012), Ms. Zittel "bridges the hyperstylized, over-produced commercial aesthetic of the Fifth Avenue retail display with the bold colors and graphic geometries of Bauhaus, with slight infusions of Southwestern/New Age aesthetic." The piece also has "several material grids/layers, which in their colors and form refer to the Modern building's façade and provides symmetry with her installed room" on the second floor Contemporary Galleries inside MoMA. 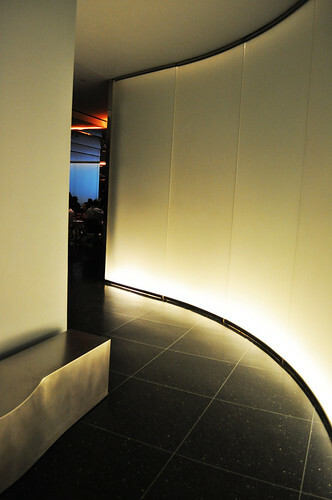 Entrance-way into the restaurant's space. We arrived bit early for our reservation, so the hostess asked us to wait at the bar and to perhaps enjoy a drink or two before our table is ready. 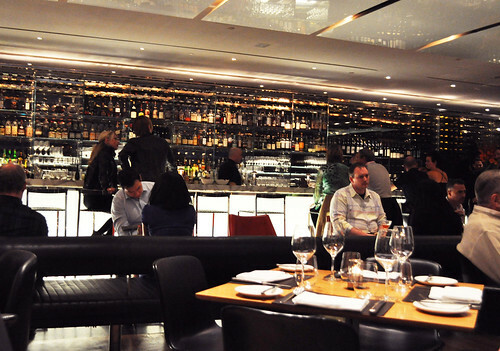 The Bar Room at The Modern has a general "bar area" that has a first-come-first-served policy along with a menu of "snacks" that can be shared. Bentel & Bentel, the innovators behind the interiors of The Modern, were inspired by the Bauhaus movement and aimed to have design play "a major role in every aspect of the dining experience." The firm selected furniture and tableware from "modernist greats" with a focus on Danish design. Some of the designers are represented in MoMA's architecture and design collection, while a number of the pieces are available for sale at the MoMA Design and Book Store. 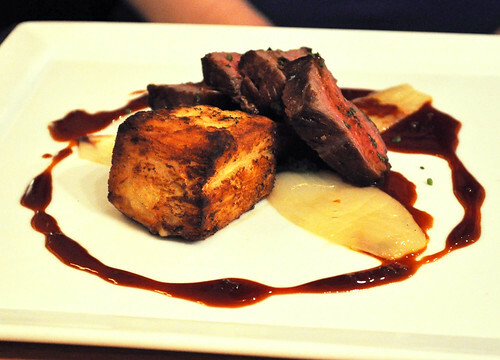 While The Modern as a whole showcases Alsatian-born chef, Gabriel Kreuther, and his original take on French-American cuisine, "the casually vibrant and bustling space" of The Bar Room serves small plates of rustic Alsatian cuisine. 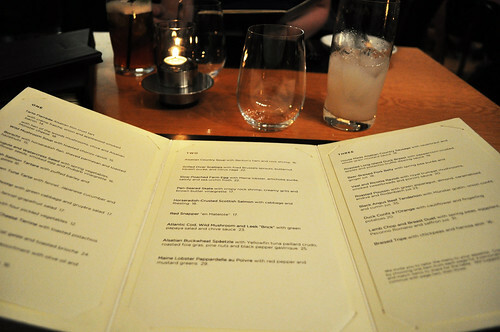 The Bar Room invites you to "tailor the menu to your appetite" by creating your own experience by choosing one item from each page (One for starters, Two for seafood, and Three for meat/game) for a personalized tasting or to mix and match items to share for the table. The suggested progression is to go from One, to Two, then Three. 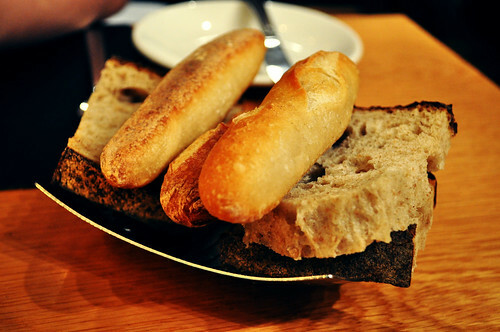 Modern bread basket of miniature baguettes and rustic artisan bread. While the baguettes were a little tough and chewy, the artisan bread was great with a soft holey interior and a loose, crusty exterior. On the table at The Bar Room. Ariana and I didn't want to go too overboard so we decided to share two starters and each get a main course for ourselves. We also had another kind of tarte -- i.e., the upside-down tuna tarte with fennel, Japanese cucumber, and aïoli. I thought the concept was really well done -- instead of just the usual rounded torchon tuna tartare, Chef Kreuther plays a little with words and food. Tartare (i.e., chopped raw meat/fish) resemble tarte both visually and aurally, which allowed Chef Kreuther to play with this idea a little. A mouthful to say, this tartare tarte had an interesting twist of fate -- it strays away from being a traditional "tart" in that it is upside-down! 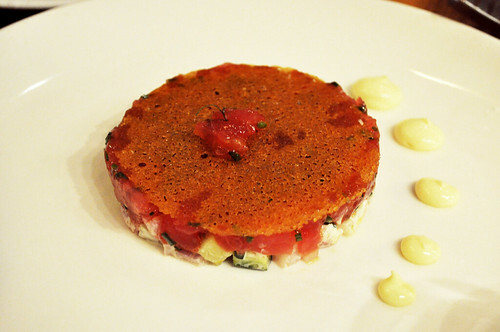 The thinnest possible "crust" (if that's what you even wish to call it) tops the tartare of tuna over a layer of aïoli'd fennel and Japanese cukes. 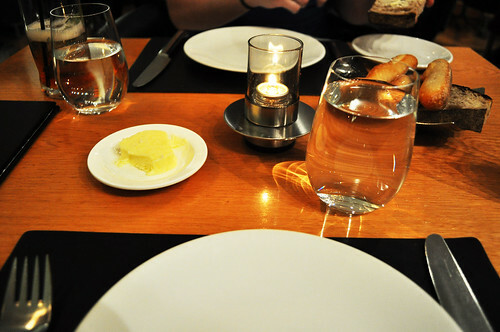 Overall, this beautifully presented dish was very refreshing as a delicate yet delicious tartare salad. 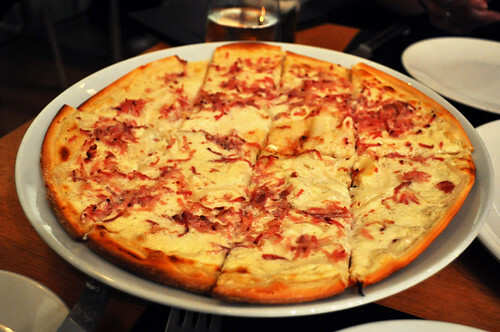 It was a nice contrast to the warm and heavier tarte flambée we ate alongside it. Ariana had the black angus beef tenderloin with a Marcona almond and Picholine olive crust as well as summer vegetables and savory jus. I stole a little bite of her thick slices of beef tenderloin, which was very tender and full of flavor. From what she reported to me, she thought this was a solid course, too. We were so full from our two courses that we decided to skip dessert and go for hot, post-dinner beverages. I had cup of jasmine green oolong tea by T of Vancouver. 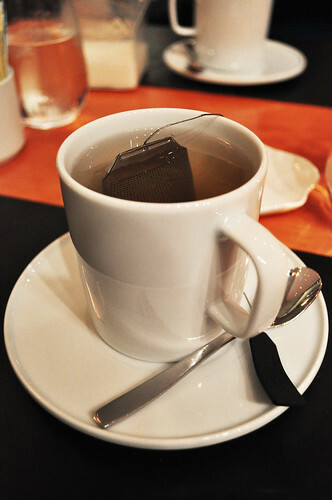 To go along with the design-savvy theme of The Modern, the tea leaves were placed inside a uniquely designed tea strainer -- one that was shaped just like a tea bag made from stainless steel hanging with a flexible wire and a leather tea tag at the end. I think I may have left the leaves in the hot water a little too long because it was more bitter than I would've liked. I usually take my tea straight up, but I had to throw in a few bits of raw sugar to lighten it a little. While it was more on the jasmine-green side of the tea spectrum (as opposed to the redder oolong types), I still enjoyed the cup o' tea. Ariana had a cup of coffee by La Colombe of Philadelphia. 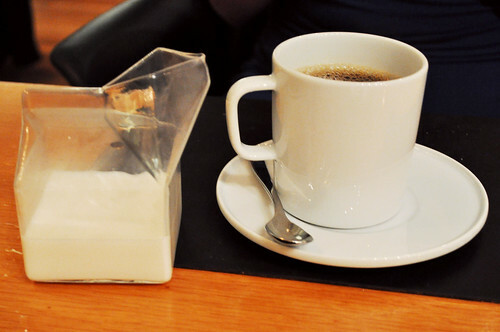 Another fun design here was the creamer container -- it was shaped like a miniature milk carton and made from glass. Very aromatic, and from what Ariana reported, very good coffee! 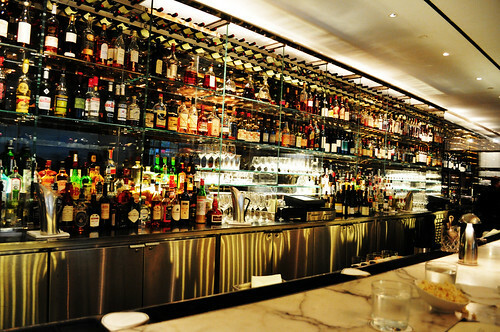 Findings: Every time I go to The Bar Room at The Modern (still have yet to eat in The Dining Room! ), it is always a treat. 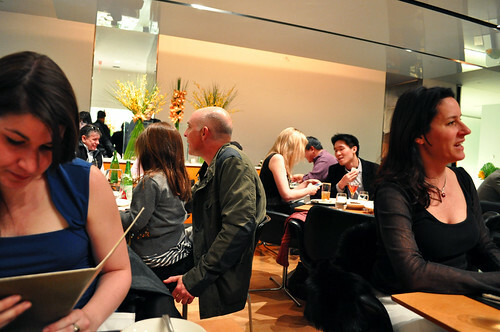 The menu constantly changes throughout the year, making it a "new" eating experience every time. The atmosphere is always bustling and lively, and I love the design-focused touches curated by Bentel & Bentel -- they always do a stellar job when it comes to those kinds of things. Albeit on the smaller portions side, nevertheless I feel the plates put out by Chef Gabriel Kreuther is are well-composed and deliberate. The ingredients included and presented on the plate are crisp and clean -- there is no excessive adornment nor are any ingredients included superfluously. 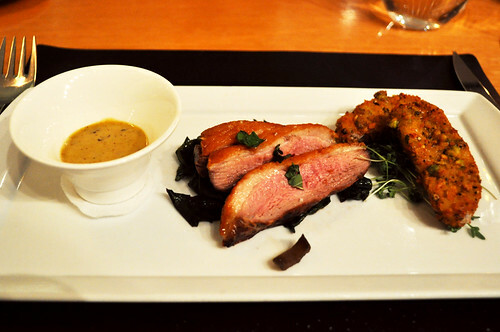 Everything on the plate has a purpose, and there is no more nor less that is needed. It is nice to know that the man behind the kitchen at The Modern is decisive and knows exactly what he wants you to have in front of you. So if you happen to be in the Midtown West area, stop in The Bar Room for well-crafted cocktails and delicious Alsatian snacks (the tarte flambée is non-negotiable -- you must order it). I'm already convinced I need to make reservations for dinner in The Dining Room to see what tricks Chef Kreuther will pull out when the portion sizes aren't so limited (*hint to Marcus* next year's birthday dinner? :P). Price point: $14-18 for each One, $19-35 for each Two, $4-6 for each warm beverage.